On the eve of Diwali, which is considered as the peak season for shopping by Indians, RBI has cautioned to examine Rs 500 and Rs 1000 currency notes before accepting them in a transaction. This advisory by RBI is deemed as crucial, as despite the expansion of online shopping, majority of shopping transactions are done by cash. It seems that large number of counterfeit currency notes are in circulation right now, as RBI had to intervene and issue warning to the common man. Interestingly, in the month of January this year, RBI had admitted that a large number of defective currency notes were in circulation, to the tune of Rs 10,000 crore. By mistake, RBI had printed around Rs 30,000 crore worth of Rs 500 currency notes, without any silver thread, which is considered as one of the parameters to check the genuineness of a currency note. 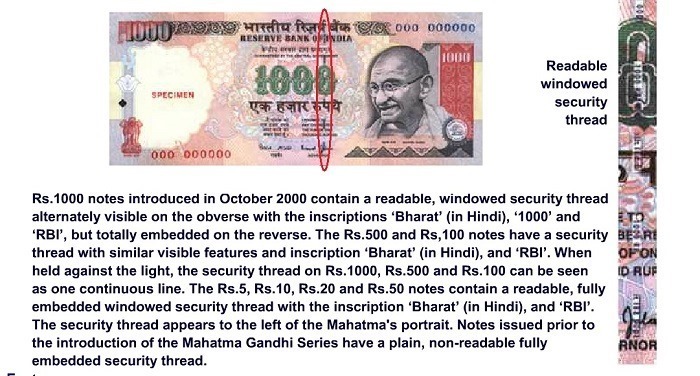 a) Actual currency notes contain image of Mahatma Gandhi with a light and shade effect, besides having multi-directional lines in watermark window. 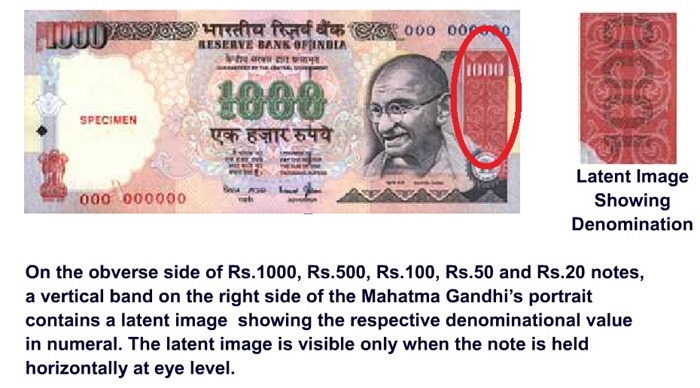 b) On the right hand side of the image of Mahatma Gandhi, a lateral band will showcase the denominational value of the currency note, when viewed horizontally, at the eye level. This holds true for Rs 20, Rs 50, Rs 100, Rs 500 and Rs 1000 notes. 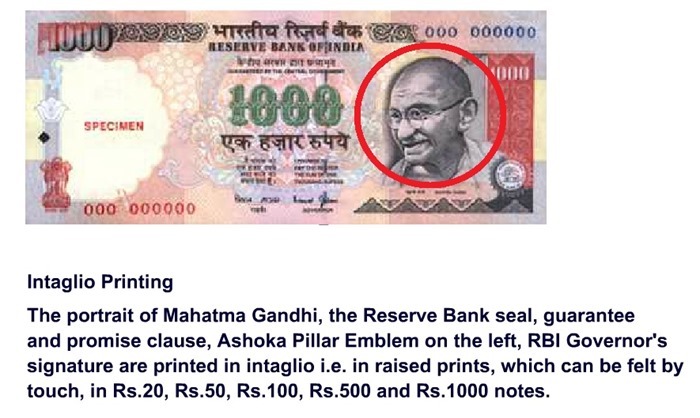 d) Few elements are integrated as intaglio printing (raised prints) on the currency notes: image of Mahatma Gandhi, RBI seal, guarantee and promise clause, Ashoka Pillar emblem on the left and RBI Governor’s signature. This can be felt by touching them. e) On all currency notes except Rs 10, a special feature in intaglio has been introduced, which is on the left of the watermark window. 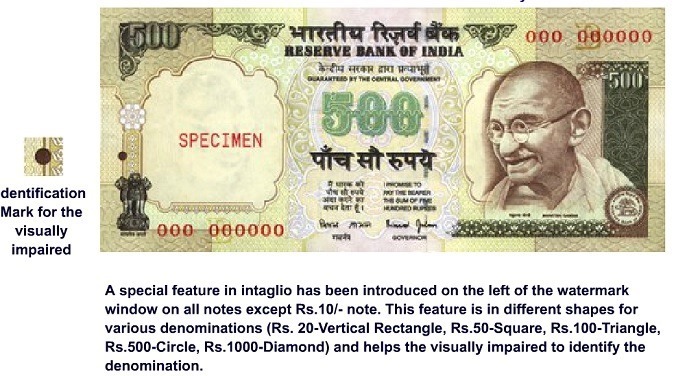 The shapes also help visually impaired to identify the currency notes. These are: Vertical rectangle for Rs 20 note; Square for Rs 50 note; Triangle for Rs 100 note; Circle for Rs 500 note and Diamond for Rs 1000 note. Absence of these elements means that the currency is fake. You can get more information on various methods to check currency notes here. If you are aware of any other instant method to check the authenticity of a currency note, then do let us know by commenting right here! "RBI Warns Common Man of Rs 500, 1000 Counterfeit Currency Notes; 5 Ways To Examine Them! ", 5 out of 5 based on 6 ratings. This is interesting because we had some similar issues in America recently. We were constantly having issues with counterfeiting but we recently added some of these same features, watermarks, threads, small distinguishing marks etc. Eventually all of the old currency will be taken out of circulation and destroyed and the new United States Dollars seem to be providing greater security.